Telangana EAMCET Certificate Verification Schedule 2018 –Web Option Entry Rank wise Dates : TS EAMCET 2018 Telangana Certificate Verification and Web Counselling Schedule Notification for Engineering, Agricultural TSCHE at eamcet.tsche.ac.in. TS EAMCET Counselling Schedule 2018 Rank Wise @ eamcet.tsche.ac.in – Telangana EAMCET Document verification Dates, Web options Schedule here. TS EAMCET Counselling Dates 2018 Rank Wise, Required certificates, Pay Processing Fee Online @ tseamcet.nic.in. TSCHE will release the complete counselling schedule and dates for every academic year. Go to http://eamcet.tsche.ac.in and download notifications from there or some other website would be provided by the officials. Download Official EAMCET Notification with dates, schedule, rank called time for SC, ST, OBC, OC, PHC, Sports etc. Be Ready with your documents like Income certificate etc, know more about certificates required for counselling here. Candidates are informed to collect the details of procedure to be followed and other relevant information from Help Line Centres on the day of Certificate Verification without fail and the same is also placed on website: https://tseamcet.nic.in. Online filing of Basic Information and Payment of Processing Fee 25th May to 02nd June 2018. Certificates verification 28th May to 03rd June. Exercising Options after Certificate Verification 28th May to 05th June. Freezing of options 05th June. Provisional Allotment of seats 08th June. Payment of Tuition Fee and self-reporting by the candidates through website 08th to 12th June 2018. 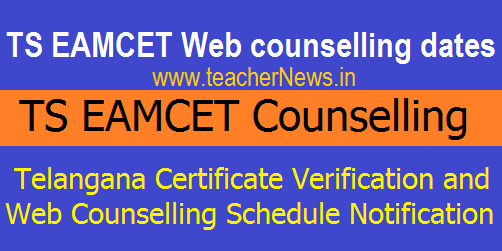 TS EAMCET 2018 Web counselling dates for Certificates verification, Web Options Entry 2018 List of documents, Important dates and how to apply on Online web options.